Vitamin D didn’t quite make it into the ‘Big 4’ but it was close. In the West vitamin D deficiency is soaring, with anywhere between 40 and 60 per cent of us not getting enough and in certain populations that rises to as much as 75 per cent! The latest health advice is that all Scots over the age of one should be taking vitamin D supplements year round, but particularly in autumn and winter. Government guidelines also recommend folk living in other parts of the UK supplement with vitamin D during the darker months as it is difficult to get enough of this nutrient from food alone. But vitamin D deficiency isn’t just a problem in the UK, as studies show that people living in warmer countries such as Australia and even UAE often don’t get enough of the sunshine vitamin! Vitamin D is both a nutrient we eat and it is made by our body. When sunshine hits our skin it synthesises vitamin D from the cholesterol in our skin and is transported to the liver where it is converted into the hormone form. Unfortunately climate change and our fear of skin cancer have meant that we don’t get access to enough sunshine to keep our levels of vitamin D topped up. Increased cloud cover in the northern hemisphere is definitely having an impact on our vitamin D levels. In parts of Scotland it has increased by 16 per cent in recent years, so we simply don’t get the amount of sunlight we used to. Plus when it does appear we immediately slap on sunscreen which prevents the synthesis of vitamin D in the body. Today we are so conscious of skin cancer many of us won’t set foot outside in summer without some skin protection. The problem is if we are low on cholesterol or sunshine then we don’t get enough vitamin D. Plus to add insult to injury, we are no longer eating foods that are rich in vitamin D like organ meat, oily fish or full-fat milk. Effectively, it’s a double whammy – we are not consuming enough or getting enough sunshine to allow our body to make it. As a result we are seeing diseases like rickets, which virtually disappeared in the early 20th century, becoming a public health concern in the UK. But it’s not just rickets; lack of vitamin D has a knock-on effect on how our body absorbs calcium and magnesium – one of our ‘Big 4’. Vitamin D also activates genes that regulate the immune system and neurotransmitters – like serotonin, the happy hormone that affects brain function. This is why some people suffer from seasonal affective disorder (SAD) in the darker months – low vitamin D due to lack of sunshine interferes with serotonin levels in our brains. And with heavy sunscreen usage and a micronutrient deficient diet some of us are turning summer into winter. There are various studies linking low vitamin D levels to mental health problems and I have listed these at the back of the Mad Diet book. If we don’t get enough many of us get depressed – even those who do not normally suffer from mental health issues. Vitamin D deficiency is also associated with obesity. Italian researchers at the University of Milan conducted a study on 400 overweight and obese people who were put on a low-calorie diet and then divided into three groups. One group took no vitamin D supplements, while the other two groups took either 25,000IU per month, or 100,000IU per month. After six months participants in both vitamin D groups had lost more weight than those who hadn’t taken the supplements. Another study published in the American Journal of Clinical Nutrition in 2014 showed that healthy levels of vitamin D were associated with weight loss in overweight women. In fact, the link between vitamin D and weight loss is slowly starting to gain interest in the scientific community with many more studies currently underway. Foods high in vitamin D include oily fish, beef liver, cheese, mushrooms and egg yolks, so it is a good idea to eat more of these foods – especially in the winter months. Plus when the sun comes out – get outside and soak some up! Obviously it’s important to protect your skin but before you slather on your sunscreen spend around 15 minutes enjoying the midday sun on your bare skin before covering up or applying sunscreen. If you have darker skin then you can enjoy a bit longer without sunscreen. In the UK the RDA for vitamin D is just 400IU and 600IU per day in the US and Canada, but research shows this is grossly inadequate. A study published in 2014 titled, “A Statistical Error in the Estimation of the Recommended Dietary Allowance for Vitamin D” has created shock waves in the scientific community as researchers on both sides of the Atlantic have evidence to prove government guidelines are wrong by a factor of 10! Taking an additional 50 micrograms (2000IU) as a daily supplement will help to top up your vitamin D level to ensure you get closer to the levels now recommended by scientists. It is important to note our bodies can’t metabolise vitamin D without sufficient magnesium levels and we need adequate vitamin K2 as well. Studies now show that low magnesium levels make vitamin D ineffective and with so many of us deficient in magnesium we must be sure to get enough of this mineral in our diet. Vitamin K2 is produced by bacteroides in the intestines so keeping a healthy balance of gut flora is vital so these wee microbes can produce enough K2. Small amounts of menaquinone (K2) is also found in certain animal and fermented foods like high-fat dairy, egg yolks, and organ meats. 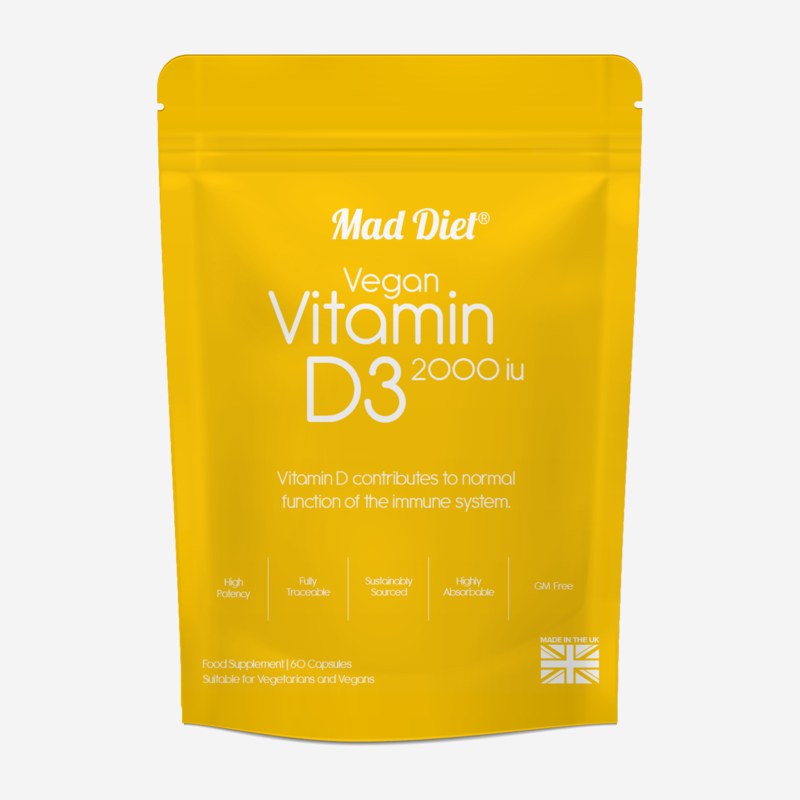 Those following a vegan lifestyle or folk suffering from dysbiosis should ensure adequate intake of K2 when supplementing with vitamin D. You can find out more about magnesium rich foods and probiotics for gut health on the “science bit” on our website.